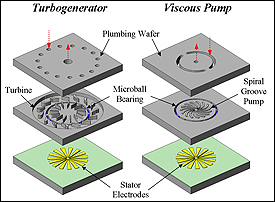 Schematic drawings of a micro turbogenerator and a viscous pump. Both use micro ball bearing technology developed by Ghodssi's team. The modern-day soldier carries a heavy load. Try to imagine running hard in a desert environment toting some 100 pounds of weapons, body armor, simple medical supplies, food and water, and an array of digital communications and computing devices. Every fatigue-inducing pound matters, including the 20 pounds of lithium ion and other batteries that power those digital devices. A team of researchers led by Associate Professor Reza Ghodssi (ECE/ISR) and funded by the U.S. Army Research Laboratory and U.S. Army Research Office, has recently succeeded in manufacturing micromachines—tiny pumps, motors, and turbines that, integrated in a microscale liquid-fuel power generation system, will significantly reduce a soldier’s battery load. The engineers’ advances also hold promise in technologies for health care (micropumps for implantable medical devices) and first responders (bio-chemical sensors). The central component of their research is the lowly ball bearing, an ancient technology now used in everything from jet engines to dentists’ drills—devices in which parts move at high speeds in close proximity to each other. Ball bearings are simply spheres made of metal, silicon, or other substances that when placed between two surfaces, such as the components of a motor or generator, allow those components to move with less friction and heat than if they were moving in direct contact with each other. The less friction and heat, the faster the components can spin and the more power they can produce. Using well-known manufacturing techniques similar to those used in the semiconductor industry to make computer chips, the Clark School researchers have successfully miniaturized ball bearing support mechanisms with microballs as wide as a few human hairs and nearly invisible to the naked eye. Using these components, they have built tiny silicon pumps, motors, and turbines demonstrating rotational speeds of up to 87,000 rpm, comparable to the speed of large-scale machinery. Micromachine systems also will help power land or air-based “micro vehicles” (also under development at the Clark School in partnership with government agencies) that will venture into risk-filled environments ahead of soldiers or first responders and send back information. Microgenerators fabricated completely in silicon and supported on microball bearings could power the vehicles’ electrical systems without weighing them down. To create their machines, Ghodssi and his team first had to conquer the science of microscale “tribology” or the friction, wear, and lubrication of tiny rolling components. They then applied this knowledge in building different types of micromachines using conventional manufacturing processes, and finally in integrating these devices into tiny systems that can reliably accomplish a task such as power generation over a reasonable period of time, and not simply burn up.